Sunday morning we left Bad Durkheim and trained to Muncih where we arrived at 1330 and checked into the hotel. From there we visited Hirschgarten, largest beer garden in the world, and Augustiener Keller, third largest beer garden in Munich with a wonderful beer hall. From there we took the underground and a tram to Hofbrau Keller (not to be confused with the Hofbrauhaus). The Hofbrau Keller and Hofbrauhaus are both owned by the state of Bavaria. The Hofbrau Festzelt, at the Oktoberfest, is actually run by the folks at the Hofbrau Keller. All three establishments, Hofbrau Keller, Hofbfrauhaus and Hofbrau Festzelt, serve, of course, Hofbrau beer which is made by breweries also owned by the state of Bavaria. Here are Marshal, Lisa and I at our table in the Hofbrau Keller. They serve just about the best Schwein Hax'n in all of Germany. The Hofbrau Keller is a bit off the beaten path so there’s usually not an overwhelming crowd but it has a wonderful, warm, inviting atmosphere and a good size beer garden too. Jeff and I with Marshal at our Hofbrau Keller table, a Stammtisch. Luckily, no locals showed up to bounce us off this locals table. After a great meal at Hobrau Keller we needed to fill the Hofbrauhaus square and were luckily enough to be offered a seat at one of the Stammtisch tables there. There were just a few German locals at the regular’s table right in front of the bandstand so we fit in quite well. This video shows some of the fun we had while we were there in the Hofbrauhaus; the cute German lady that invited us to sit with her asked us to sing along with her and then got Weezer us to dance with her, then some strange red spandex lederhosen. Next day on our way to our tent for the night. We stopped to get a picture of the Augustiener tent. This tower is a new feature at this tent, and really, if you don’t have a tower then you’re just a lesser tent. Jeff always likes to get a picture with the Augustiener logo, JW. Monday night we were in the Löwenbräu tent. Here’s our group, me, Weezer, Simo, Mike, Marshal, Lisa, Gloria and Jeff. Jeff and I in the Löwenbräu fest tent. A scan of the Löwenbräu tent from our table right in front of the bandstand. Another scan of the Löwenbräu tent but this time we go vertical. You might recognize this traditional German tune. Night Two in the Winzerer Fahdl Paulaner tent. Locals never come to the Oktoberfest. Yeah, right! Don't you just hate those couples that wear the same shirts. So this is what that lederhose flap is for. Walking out of the tent on the way back to the hotel. The statue Bavaria at the southeast end of the Oktoberfest grounds. The Paulaner and the Löwenbräu towers, our two tents at Oktoberfest 2012. Well, another successful Oktoberfest, our 14th. Next year's Oktoberfest is going to be a very special one for us, besides being our 15th, but you'll have to wait until then to learn why. We're very excited about coming back to the world's largest festival in 2012. One last video that sort of sums up our five days at the Bad Durkheim Wurstmarkt and Munich's Oktoberfest. These festivals in Germany are all about something they call Gemuetlichkeit. I'll have more about that in another blog soon but the pictures you've seen on our blog from Bad Durkheim and Munich are all about just that, Gemuetlichkeit. This video expresses Gemuetlichkeit in another way and shows what a wonderful time we had with our friends along the way. Near the Kaiserslautern city center is a rather unique monument. It’s a virtual reality memorial to commemorate the Jewish synagogue that stood there until August 1938. At that time Kaiserslautern was slated to become a center of Nazi influence in the Palatinate part of Germany. Having a prominent Jewish synagogue in the city did not help the city’s desires to attract Nazi favor so the city elders decided a closer adherence to a local architectural code and a need for a parade field meant that the synagogue must come down. The last service at the Kaiserslautern synagogue was on 27 August and the demolition of the building began a few days later on 31 August 1938. This occurred just a few months before Kristallnacht (Crystal Night), the Night of Broken Glass, when Nazi led crowds in Germany and Austria attacked over 1600 synagogues, setting 267 on fire. 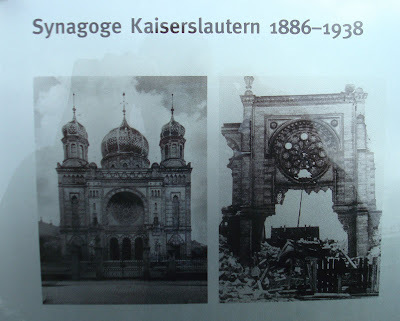 Ninety-five synagogues were destroyed just in Vienna. When the Kaiserslautern synagogue was leveled it had a Jewish membership of 738, in 1945 less than 25 remained. 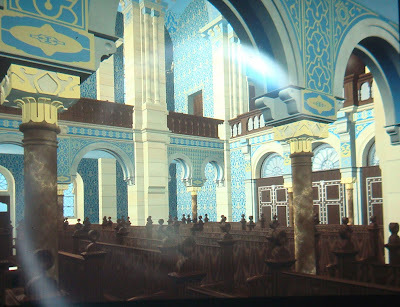 In 1994 when a synagogue in Lübeck, Germany was set aflame a professor at Technical University Darmstadt was so alarmed that this behavior would return to Germany that he and eight of his students began work on a means to save or recover the images of buildings that no longer existed. What they came up with is a system called 3d-cad-simulations. It allows a viewer to see a building, three dimensionally, which no longer exists, exterior and interior. Kaiserslautern would use this technology to create the memorial to its lost synagogue. 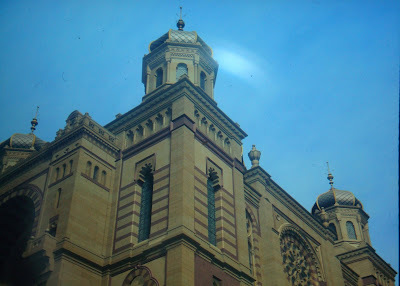 The city had placed a memorial plague and declared “The Synagogue Square” in October 1980. In September 2002, Kaiserslautern rebuilt a portion of the original synagogue’s archway and then encircled the area where the building had stood with 3d-cad-simulation view ports. Jeff and I were recently in Kaiserslautern for the day and stopped by The Synagogue Square. The city really has done a nice job telling the story and showing where the synagogue stood and how it appeared. 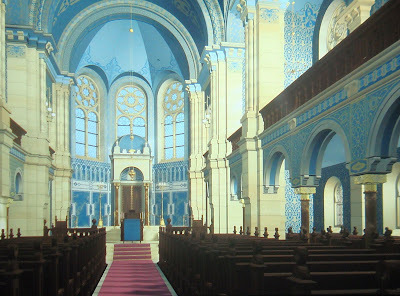 These pillars are replicas of the original synagogues main entrance. From behind the main entrance pillars you can see two of the stainless steel view ports. Lean over and look into the view port and you'll see the synagogue as it looked from that angle over 70 years ago. A plaque at the memorial shows how the synagogue appeared and main entrance before final, complete demolition. We took some pictures through a few of the view ports. 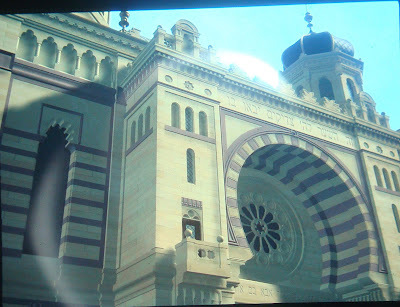 You can see a reflection of the camera lense but also a pretty good image of what magic the view ports reveal, both outside and inside the synagogue. For anyone in the Kaislautern area that might be interested in seeing The Synagogue Square, it's at the corner of Fischerstraße and Schubertstraße near the city center. Jeff and I went to the Bad Durkheim Wurstmarkt last Saturday. The Wurstmarkt is always the second and third weekend of September and takes place just 40 minutes from our home. This was just a tune-up for next week when friends from the states will be joining us for Friday and Saturday in Bad Durkheim. So, just to wet your appetite for the main event next weekend here's a couple images. Typical 1/2 liter glass of chilled white wine (Silvaner) at the Wurstmarkt and the world's best tasting pommes frites, mit Mayo. Sitting at our favorite vintner tent, #15. The Wurstmarkt is all about wine, food and fun. Look at those big ham roasts. Makes an awesome sandwich. Pork and more pork. The new Saline, structure on the right. Finally rebuilt after it had been completely destroyed by fire about six years ago. The St. Michael chappel on the vineyard hill in the background. The religious pilgrimage to that hill is what started a small festival which has grown into today's Wurstmark, the 590th. Well, it was such a nice day and we were having a wonderful time so we called our regular hotel in Bad Durkheim, the Kurpark, and asked if they had any rooms. Jackpot!! So we changed our plans to spend the night. We scanned the hotel grounds after we checked in. In spite of what Jeff says, we're in Bad Durkheim, not Bad Krueznach; silly man. You can see by the dancing German couples that the festival even reachs to this part of the town. Picture taken from our hotel room. Giant wine barrel on the left, St. Michael chappel on the hill, big Ferris wheel on the right. The vinter tents are located in front and right of the Ferris wheel. Advertisement by the elevator in our hotel. Europeans aren't shy. 0930 on Sunday morning, on the way home. Vintner tents are empty but getting ready. See you Friday. Strasbourg is the capital of Alsace. It sits along the Ill River which flows into the Rhine River just east of the city. Across the Rhine lays Germany and its Black Forest. Strasbourg shares its past with Alsace of having been part of France and Germany at various times throughout history and, like many towns in Alsace, has a Germanic name. Having one of the largest ports on the Rhine River, Strasbourg has long been a major commercial center. Strasbourg suffered all the usual events of ancient European cities, war, sickness, religious persecutions but in July 1518 the city was visited by the mysterious Dancing Plague. Some 400 citizens were struck by a dancing mania that caused them to dance constantly for weeks and resulted in most of them dying from heart attack, stroke or exhaustion. Strasbourg's magnificent city center is actually a large island in the Ill River, the historic Grande Île (Grand Island), the location of most of the city's tourist attractions; the Strasbourg Cathedral, the Cathédrale Notre-Dame-de-Strasbourg or the Cathedral of Our Lady of Strasbourg and Petite-France. Today, Strasbourg is the location of the European Union Parliment. After we checked into our hotel we walked to Cathédrale Notre-Dame-de-Strasbourg, the Strasbourg Cathedral. It is incredibly beautiful and, having been the tallest building in the world until 1874, it is still visible from miles around. Like many European churches, the Strasbourg Cathedral is built in the shape of the cross. Inside is truly breathtaking. The cathedral's stained glass windows are some of the oldest in the world having orginally been installed in the 13th and 14th centuries. The back window of the cathedral and the main organ. Located in the right transept is the Pillar of angels, here on the left, and one of the largest astronomical clocks in the world. Although not the original clock located here this one was built around 1840. It tells the phases of the moon, equinoxes, leap years, current zodiac sign and much more. At 1230 PM each day the entire clock can be seen in motion. Maison Kammerzell is a medieval building built in 1427. It sits in the square just outside the cathedral. There are lots of ancient rooftops in the Strasbourg city center. This highest roof is also just outside the cathedral. Really amazing to think of medieval workers building these tall structures. Those top windows are on what looked like a ninth floor. The next morning we're walking around the corner from our hotel to a nice brakery when we run into this. Europeans sure like the mad baby theme. He had a great breakfast at Kern which turned out to be much more than just a bakery. We had a tasty Quiche Lorraine and a pastry. Kern also had a nice vegetable and butcher area. It was lots of fun to watch the butchers in action; prepping a chicken for sale, removing the head and claws. Here's a full beef leg they were getting ready to work on. An entire rib cage at the Kern butchers. Not sure what it is; goat, pig, lamb, deer, small horse. Also, for sale were rabbit, duck, pheasant, dove; seemed like every type of small animal. A major attraction of the Strasbourg city center is an area called Petite-France. Numerous old half-timbered buildings and homes right on the Ill River. On the upper right of the roof you can see the structure that is placed high on various structures to attract storks and hopefully build their nest there. Guess there's too many tourists around to attract them here. You know doing this tourist thing can really make you thirsty. So once in a while you've got to stop and quench your thirst. Here's an interesting logo on a fine French beer, Fischer Tradition; a little boy sitting on a beer keg drinking from a huge glass of amber nectar. Not too PC these days. Fun couple days in France. Happily we filled two squares; Alsace Wine Road and Strasbourg. Pretty sure we'll be back since it's so close, probably wine inventory gets a little low. Au revoir!! !